The drive meets requirements for enclosure class IP 20/Chassis. Optional IP21/NEMA 1, IP55/NEMA 12, IP 54/NEMA 12 or IP66 NEMA 4X. The VLT® AutomationDrive features logic control functions and a sequence control based on events and actions. The drive is delivered as standard with the Safe Torque Off (Safe Stop) function, in compliance with EN ISO 13849-1 Category 3 PL d and SIL 2 according to IEC 61508 low demand and high demand mode. STO can be extended to comply to PL e / SIL 3. The safety functions can be extended to include SS1, SLS, SMS, SSM, safe jog mode etc. with the VLT® Safe Option MCB140 Series and VLT® Safe Option MCB150 Series. The Local Control Panel (LCP) can be plugged in or out during operation. Settings are easily transferred via the control panel from one drive to another or from a PC with set-up software. The VLT® AutomationDrive conforms to class 3C2 (IEC 60721-3-3) as standard. If used in especially harsh conditions it is possible to order a special coating that complies with class 3C3. The AutomationDrive is available in a ‘ruggedized’ version, that ensures that components remain firmly in place in environments characterized by high degrees of vibration such as marine and mobile equipment. Support for any non salient permanent magnet motor for better system efficiency in both VVC+ and FLUX mode. Cooling can take place in two ways to offer different sets of benefits. Forced convection cooling: A fan blows cold air through the cooling ribs of the aluminium base to remove heat. The channel is easily cleaned without touching electronics. Cold plate cooling: External cooling is possible through the back side of the aluminium base. Panel through mounting: Electronics inside cabinet - power heat sink outside cabinet. Duct cooling: Air from the control room – or from outside – cools the heat sink without contact to the electronics. 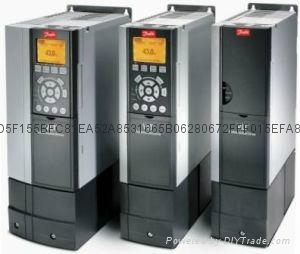 For the VLT® AutomationDrive FC 302 a wide selection of accessories is available to suit your needs. For further details see Operation Instruction. Options for bus communication, synchronisation, user programs, etc., are delivered ready to plug-and-play.